The 15th July started like pretty much any other day, but it certainly didn’t end that way. We woke up very early to the sound of the various dogs staying with us welcoming the day – in other words, barking their heads off! We know all of our charges intimately – most of them are with us in the house because we have had to nurse them back to health, monitoring them closely for signs of any change for the worse – we know all of their signature barks and today, there was one we didn’t recognise. The rescued kitten has been named Hayley. Later that morning, Diane and I were setting off for Smolian when we spotted a tiny pup running across the road. As soon as we stopped, we noticed that there were two more pups on the opposite side of the road. We jumped out of the car and within seconds the two pups came over to us. 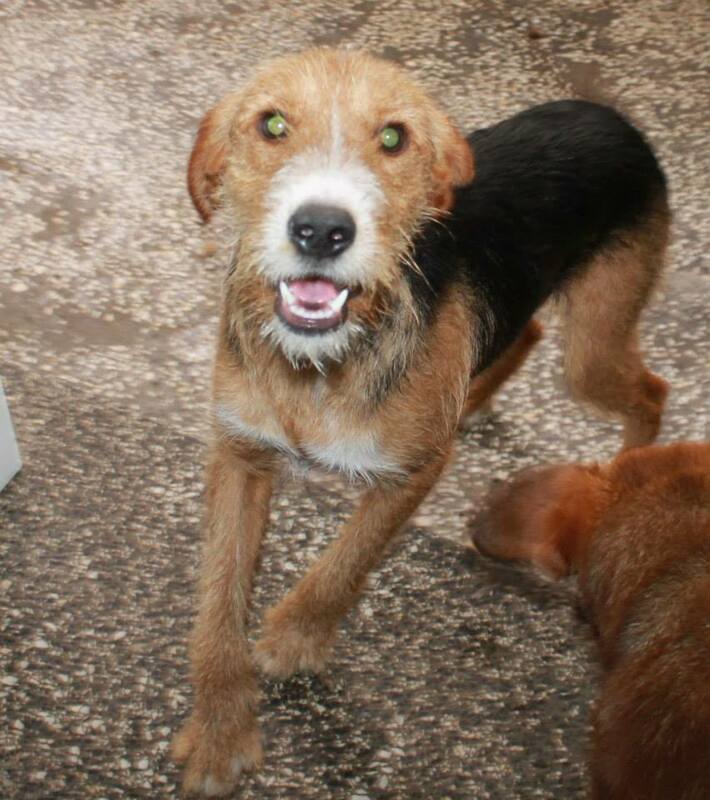 Although they were timid, they wanted to be friends which made us think they were used to people and had just been dumped – feral dogs will usually just run off screaming. After some coaxing, Diane managed to pick up all three of them and we took them back to the house before once again setting off for Smolian. 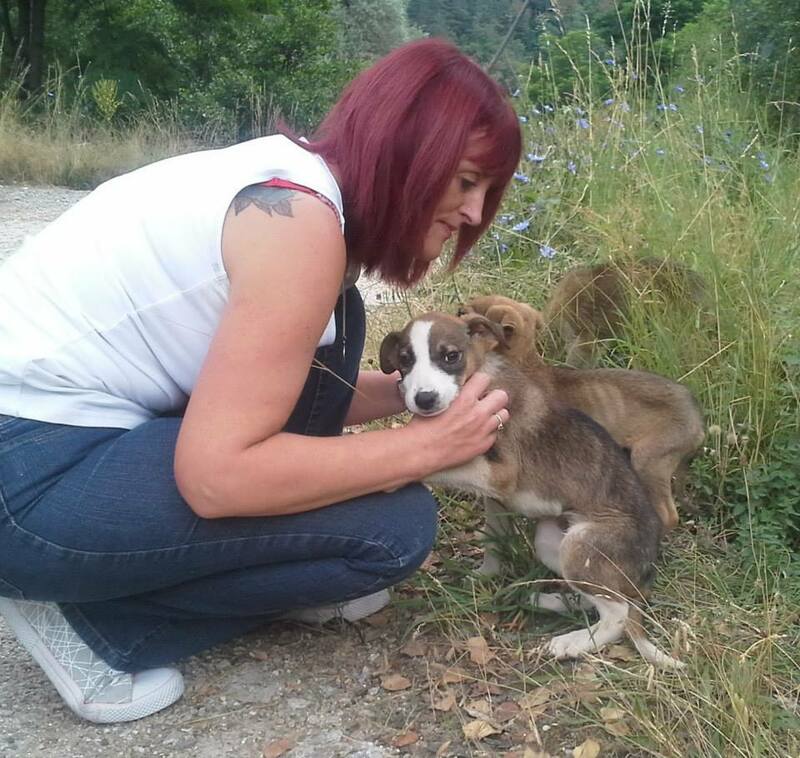 Diane reassures the pups by the side of the road. Our next rescue was somewhat more dramatic. When we arrived in Smolian, we spotted a very tiny, young pup running about in the road. Even before our car had come to a stop, Diane had leapt out. You can see here the moment that she springs into action, taking charge of the situation and stopping buses. The little pup was so terrified that she scurried under some bins and then under a parked bus. We were so worried that she would dart in to the road and be killed, but eventually she ran into some bushes and, after a while, I managed to scoop her up. She was scared and refused to look at us. Her wound has become infected. She took a long time time to settle down. Number 210 – shw won’t be just a number any more. She was very scared of people which is understandable considering what she has been through. Over the days since we found her, Jikke, as she has been named, is doing well. She is still safe at our house and getting to know her room-mate Ronnie, but she has her own space where she can hide if she wants to. Click here for a clip of Jikke and Ronnie playing together. She is developing her confidence around humans, taking food from our hands and showing an interest in what we are doing. When we go into her room, she wags her tail and “talks” to us. She will approach very cautiously us and is then happy to be stroked. We will take out her ear tag, but for now we are just giving her time to get use to us. We do not want to have to wrestle with her to keep her still. Jikke will eventually be vaccinated and microchipped and, when she is confident enough, she will be available for adoption. Until then she is safe and will be loved and cared for. We will do all we can for her and hopefully one day she will have her own family. 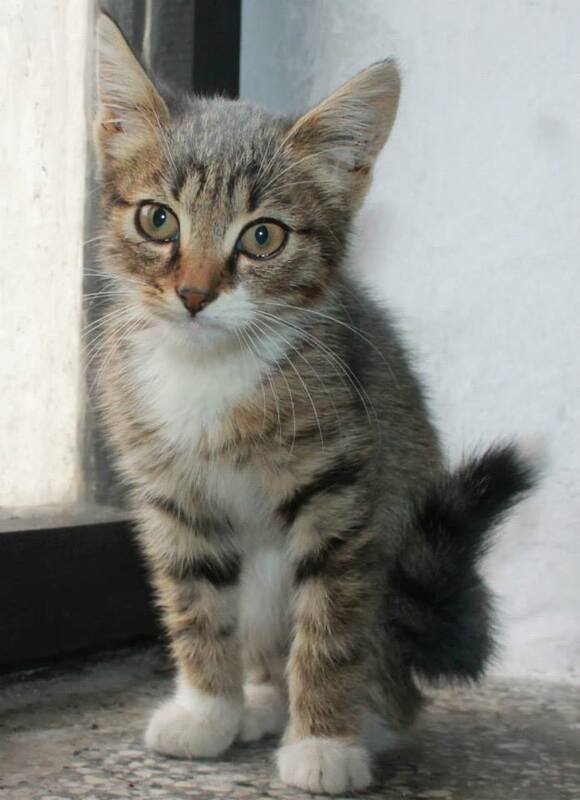 If you are interested in adopting any of our cats and/or dogs, please visit the adoption page on our website and complete an adoption questionnaire for the UK, or visit the RSDR Netherlands website (depending on your location). Please also feel free to complete a questionnaire to register an interest in a dog or cat who is not yet ready for adoption.